Move over Snow White and Cinderella, there’s a new princess in town and she’s definitely no Sleeping Beauty. The brash heiress to the kingdom of Dreamland likes to drink and do drugs and she’s not going to marry a man just because her dad tells her to. The latest animated addition to Netflix’s line-up has all the things you want in a female-led comedy. From the mind of Matt Groening, comes the 10-episode adult animated comedy fantasy series, Disenchantment, launching on Netflix this Friday. 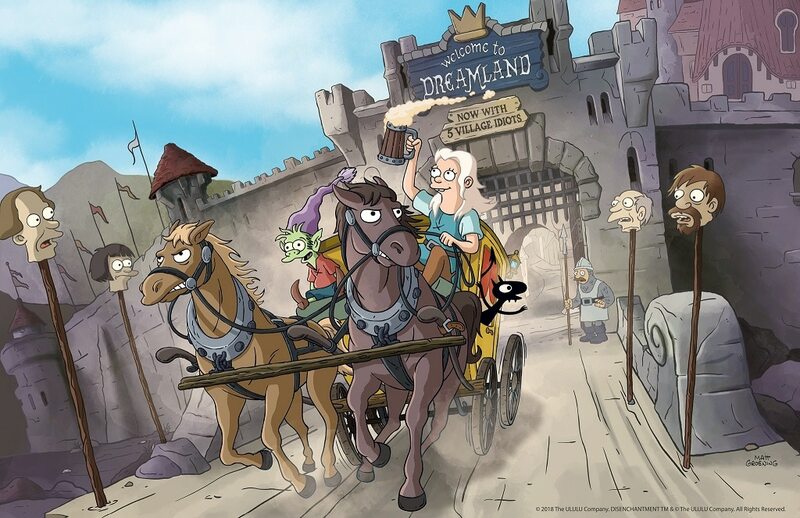 In Disenchantment, viewers will be whisked away to the crumbling medieval kingdom of Dreamland, where they will follow the misadventures of hard-drinking Princess Bean and her friends Elfo and Lucille. Feeling alone in a world that doesn’t understand her, Bean is further cursed when a demon appears – called forth by two mysterious characters. The demon, Lucille or Luci as he is more commonly called, plays the devil on the shoulder to an already mischievous young woman. The Dastardly Duo becomes the Troublesome Trio when Elfo appears at an important moment on Bean’s wedding day. The happy and innocent-seeming elf finds himself in Dreamland when he is found with the elf king’s daughter and banished from the magical elf kingdom. The creator, Matt Groening, is best known as the creator of Futurama and the mega-hit, The Simpsons. With 10 Emmy awards for The Simpsons and two for Futurama, Groening knows a thing or two about animation. That’s why, when the news broke that he had partnered with Netflix for a new animated show, people were excited. Not only that but the actors voicing the main characters are some recognizable voices. In the lead role of Bean, we have Abby Jacobson, whom you might know from Broad City (and Bojack Horseman). Additional voice talents include Eric Andre (Man Seeking Woman, 2 Broke Girls, Don’t Trust the B—- In Apartment 23) in the role of Luci and Nat Faxon (Friends From College, Married, Ben and Kate) as Elfo. The show has a slightly edgier feel, partly due to the stuff you can get away with on streaming sites versus network television. It’s not so much that it’s a big departure from what you might be used to from his previous body of work but it’s just different enough for it to feel more like an adult animated show than family fare. Although clearly set in medieval times, the references are more subtle and well-timed and don’t make it seem like the show is trying too hard. My favourite part of the show is the character, Elfo. His innocence acts as a balance for the not-so-innocence of the other two main characters, though you’ll notice the effect they have on him. The funniest moments, for me, came from the scenes in which Elfo was involved. Overall, the show is reminiscent of The Simpsons episodes where we get the different family members taking on roles in stories that are different than the main premise. I’m pleased with the nods to current socio-economic issues but the jokes should hold up over time. You’ll get the same Matt Groening feeling you’re used to but with more of a connected plot than standalone episodes. Because of this, you can either binge the show in one sitting or pace yourself.